PARENTS are being guilted into paying out "voluntary" contributions to NSW public schools, with principals going as far as putting EFTPOS machines on the table at parent teacher interviews. Despite being funded by the NSW government, the schools are taking a carrot and stick approach to get more parents to pay the optional fee - which ranges from $50 to about $250. Some are even bringing in EFTPOS machines to parent teacher evenings to conveniently put the squeeze on parents while other have even warned mums and dads that their response to the payment system has been "disappointing" with some even scheduling appointments for those who can't pay to tell the principles themselves. And those who do pay are being rewarded with access to school raffles and entry into special school programs like sport and dance "at no cost." Schools are putting pressure on parents to pay the voluntary fees. It appears the hard line approach is working with NSW public schools last year raking in a whopping $34.1 million from parents across the state - up by about $2 million from 2016. 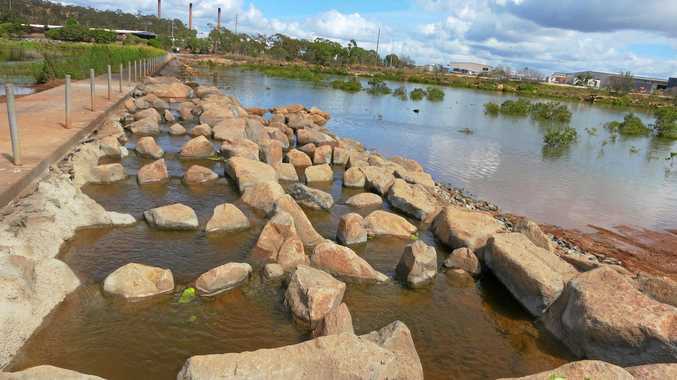 "There has been a very disappointing response with just 15 per cent [81 students] paying the contribution," the Principal at Chester Hill North Primary School Helen Colquhoun wrote to parents in the newsletter earlier this year. 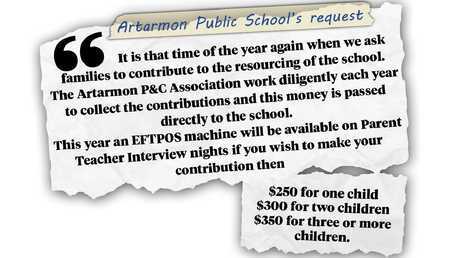 In 2016 Artarmon Public School started bringing EFTPOS machines to parent teachers night to get tight parents to cough up. "This year an EFTPOS machine will be available on Parent Teacher Interview nights," it said on the school website. At East Hills Primary school relieving principal Gina Longo wrote in a school memo that: "Voluntary contributions are funds that we use to purchase necessary teaching and learning resources for your child's classroom." At this school poor paying parents had to make an appointment with her to explain why they couldn't pay the mandatory $60 by the due date of April 2 this year. "If any parent or caregiver is experiencing difficulty in making the payment please make an appointment to see me through our school office," she wrote. At Oaklands Flats school, principal Daliya Phipps says payment was "essential". "Each year a large amount of money is spent on equipment, teaching aids, resources etc which are essential to the effective education of your child," she wrote in last year's school induction book. The Daily Telegraph has obtained data of the 2231 NSW Public Schools revealing which school communities pay the most and which schools pay the least in terms of voluntary contributions. Sydney Boys High School topped the list, receiving $1.4 million from parents. Epping Boys High followed with $432,000 and Northern Beaches Secondary College Manly campus received $420,000. Largs Public School in the Hunter had the lowest contribution from parents at just $5, followed by inner-west school Russell Lea Public had just $6. It was followed by Mullengandra Public School which received just $10. A total of 469 public schools did not record any voluntary contributions for the 2017 school year. Sydney Boys High School topped the list with over $1.4 million in contributions. The Department of Education website says the contribution is "voluntary" but the department did not respond to a request for comment on the matter. But experts say the approach is effectively turning the local public school into fee paying ones. Deakin University Education expert Dr Emma Rowe said the children of parents who were donating the big bucks were being given special access to opportunities and preferential treatment. "Absolutely it happens … if parents are donating a lot of money to the school they'll get looked after." "I have had parents talk to me about being on the opposite side and there were groups of parents who weren't given access to certain programs for their kids. The ones that parents had spoken to me about were about sailing and skiing." "The teachers will look after their kids and they will get looked after and might get the better role in the school play - but often these things they're not happening on the surface." The Department of Education website states it is a decision for parents on whether they should pay. "Principals will ensure that no student or family suffers any discrimination or embarrassment over failure to make a voluntary or subject contribution," the website says. "Confidentiality, privacy and dignity must always be maintained concerning contributions." 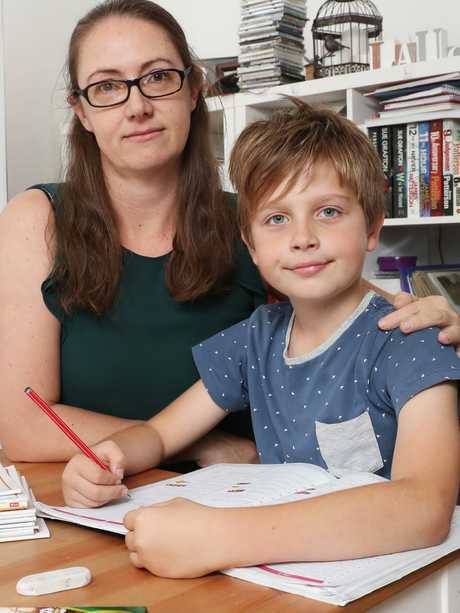 Mum Chantal van der Merwe sends her 9-year-old son Liam Walters to Artarmon Public school refuses to give in for the demand for $250 in cold hard cash. She spends plenty of coin at the various fundraisers the school holds throughout the year and sells Entertainment Books to help the school meet the shortfall. "You do as much as you can but $250 seems like a lot," she said. She actively plays a role in organising fundraising activities. "I did it with all the year three parents - that's your year to do the other fundraising and the school fair and the Picnic Day."